The former San Lorenzo church (Ex Chiesa di San Lorenzo) contains plinths from the first church built here in the 6-9th century. The current building dates from 1580-1616. More history about this building. Photographs: Sonja van Kerkhoff, 2013. 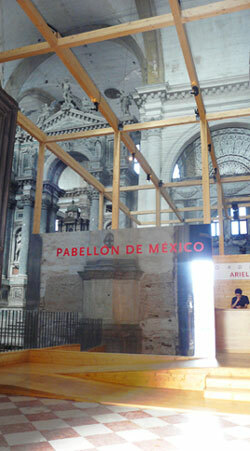 Detail of the Mexican Pavilion at the 55th Venice Biennale in the former San Lorenzo church. Click to view this in a larger format. 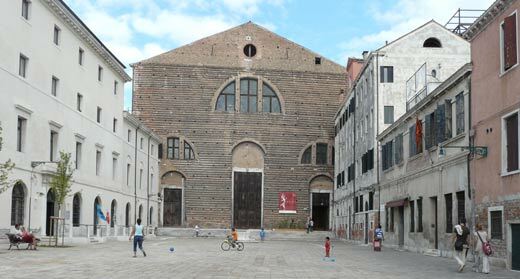 The San Lorenzo church, known for its acoustic qualities was last used in 1984 as a venue for the opera Prometeo by avantgarde composer, Luigi Nono. 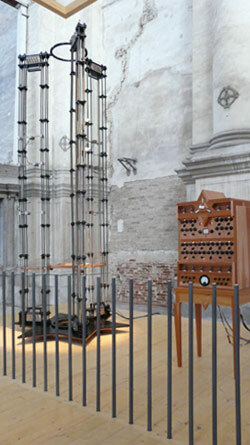 “Cordiox,” by Ariel Guzik in the Mexican Pavilion of the Venice Biennale, 2013. 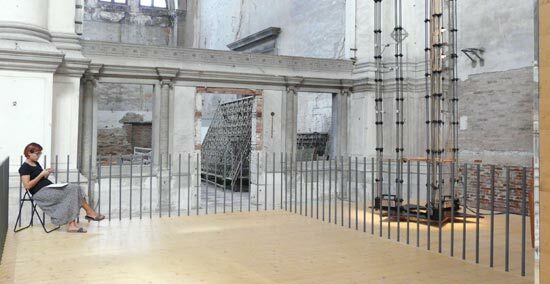 The Mexican presence at the Venice Biennale was a compact wooden platform which occupied about a quarter of the space inside the derelict San Lorenzo church at the edge of a large square, about a 10 minute walk from Saint Marco square. This disused stone and brick building from 1580-1616, has been loaned to the Mexican Government for 9 years as an art and architecture venue on the condition that they renovate it. I think this is a brilliant step. Now Mexico has a semi-permanent location which involves bringing life back to a derelict building and the long term arrangement means that visitors in future years will find their way back to an ongoing project. Stepping into the church, visitors were confronted with a heightened sense of the spatial. The wooden platform provided views down and around the rubble and ongoing repairs in the rest of the church. The wooden minimalist platform -the pavilion- within this historic shell functioned like a metaphor for the postmodern where layers and traces of the past coexist with the present continuous. An ambiant sound work by Mexican artist, Ariel Guzik eccentuated this sensation of being in several time frames at once. The sounds from his “Cordiox,” a 4 metre high 180 string instrument, translated vibrations caused by any movment in the space into subtle sounds. Sounds that were simultaneously the sounds of the acoustics of this building, to which the artist had tuned his instrument. So what you experienced were the sights and sounds of this instant of your physical presence on this platform combined with this instance of the church’s acoustic interior. It was if the rubble was murmuring. this looks like a beautiful piece of work- I wish I could hear recordings of the sound- Ariel Guzik… I would like to hear his work.